Just Saved This Guy’s Life! About 20 defibrillators have been installed in Leicester parks, including Victoria Park. Training in how to use them was offered, so I decided to go along. I met this guy there, and saved his life! He looked in a bad way before I started! Well, it’s obviously not quite true as he is the defibrillator equivalent of a crash test dummy. The training session was organised by the Parks Dept and held at Evington Park. About 12 people took part over about two hous. The trainer was Alan White, who used to work as an A&E consultant. He was very experienced but also friendly and approachable, and the training was fairly informal and hands-on. Nobody should feel they can’t do it, or that they won’t learn from it. The training was broader than just using a defibrillator. It included: an initial assessment of danger – to the patient or yourself; whether the patient was conscious and responsive; and the need to call for assistance – from bystanders and the emergency services. Then check airways, check breathing, and if neccesary carry out CPR (cardiopulmonary resuscitation) which are rythmic chest compressions to maintain breathing and oxygen supply. You might remember the TV ads which use the song Staying Alive as a reminder of the correct frequency – 100 to 120 beats a minute. This is where the guy in the picture came in. He’s on his back, you place the ball of one hand in the centre of his chest, other hand on top of the first, arms straight to carry the weight of your body downwards, rapid compressions to maintains his ventilation. You’ve got to move his chest enough to operate the lungs so a fair pressure is needed. If you get it right the dummy clicks to show the pressure is sufficient. Don’t read this as a guide to how to do it – you need the training for that. It’s not hard, you will learn a lot, it only takes a couples of hours, and it’s free. Why not go with a partner – you might one day save their life, they might save yours, or you both might save somebody else’s. You can contact Alan White by email here and he will arrange a training session. Remember it’s free, all it will cost you is a couple of hours. Isn’t this just for old people? Unfortunately not. Alan White works with the Joe Humphries Memorial Trust which was set up by Joe Humphries parents in memory of their son, and it aims to promote training in CPR and defibrillator use. Joe was 14 years old and he collapsed with Sudden Arrhythmic Death Syndrome (SADS) whilst jogging just two minutes from home. A trained person might have saved him. Read about Joe here. 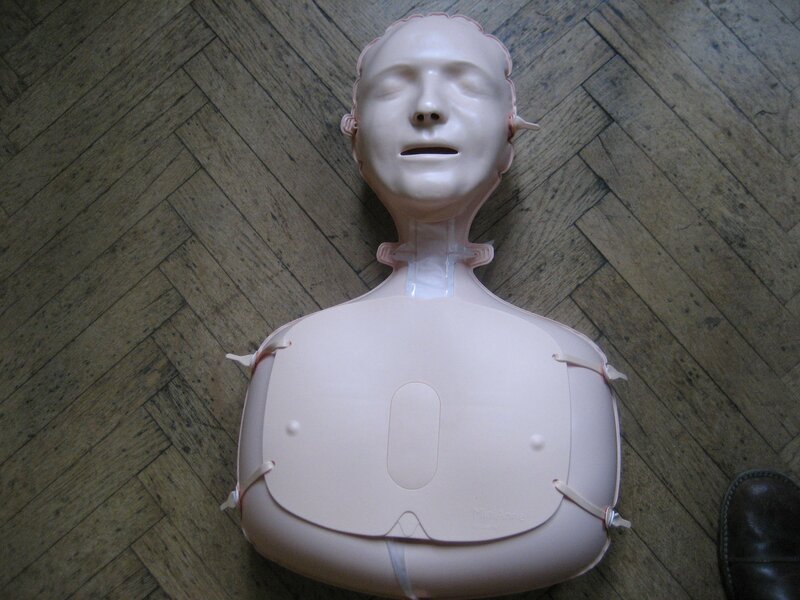 There are lots of websites which cover the essentials of CPR and defibrillators. It’s better to have the training, but if you want to know more first do a web search for DRSABC, or you could start by clicking British Heart Foundation which will tell you a lot more about it. The best way to find out more is to do the training. I did, and I can’t think of a more useful two hours that I’ve had in a very long time.